Do you know the 6 "C"s of quality? - Something New Everyday! Home Professional Do you know the 6 "C"s of quality? Do you know the 6 "C"s of quality? Quality is never a one trick pony. One can not simply “Be quality” or “do quality”, as much as engaging in a series of actions that lead to the overall quality of your process and your products. While Quality Process and Quality Control can seem daunting at times, remembering your six “C”‘s of quality helps keep the process in perspective. Comprehension – Do you comprehend your process? Do you understand all of the steps needed to be successful? Do you know how something is built or why something functions the way it does? Comprehension is key to success in a quality process. Commitment – Are you committed to finishing your work on time and in full? Are you committed to the quality process and producing exceptional products in a timely manner? Are you committed to being a champion for the cause of quality in your department? If yes, then you are committed to Quality. Competence – Are you competent to do your job and live up to the standards of quality set before you? Are you proficient at performing the tasks that are essential to your quality process? Communication – Are you able to communicate your quality needs to supervisors, coworkers and customers? Are you able to relay the proper information for exact results? Are you able to break down complicated tasks and ideas into an understandable language that everyone can understand? If so, you are communicating with Quality. Correction – Do you fix errors as they come up? Do you find new ways to avoid errors in the future? Do you help others in making corrections that will improve a product, service or process? If so, you have a hand in the correction of quality. Continuance – Are you dedicated to continuing on the path to Quality? Are you taking steps to make the next day better than the last? If so, you have a continued outlook toward Quality! 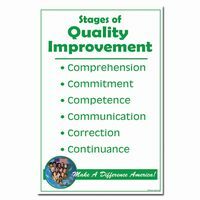 We’ve developed a poster to recognize these states of Quality Improvement. Hang these posters anywhere in your facility where a reminder of quality will help.